After my family had moved from Akron to the Elyria area, we made almost weekly trips back to the Rubber City each weekend to visit with relatives. When we got to my grandparent’s house on Brown Street, I would manage to cut myself loose to journey the two blocks to the Rexall Drugstore to check out the comic books there. This came during a crucial time in my life when I was just getting my bearings and starting to chart a course for myself in life. The comic books at Rexall became my guiding stars. It was there that I first found the Atomic Knights, Adam Strange, The Atom, Hawkman, Green Lantern, and, of course the Flash. When I picked up #115 my first issue of The Flash, I raced back to my Grandparents house, plopped myself on the glider on their front porch and was transported to another world. A world in which gorillas had secret cities in deepest darkest Africa. 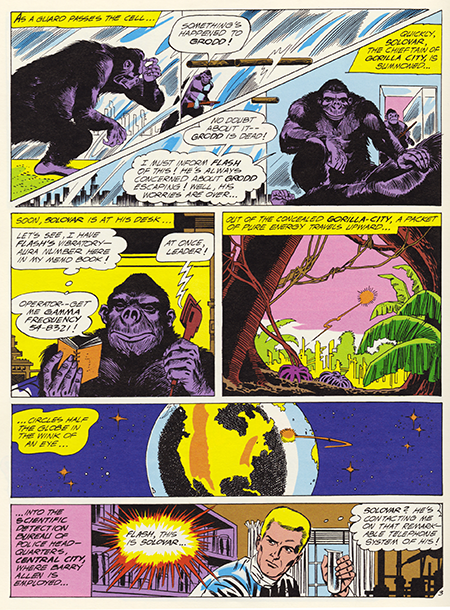 A world in which an evil gorilla named Grodd could escape an inescapable prison by swapping minds with a man in Central City. A world in which he encountered a superhero called The Flash and with whom he would do battle in bizarre, byzantine, and bravura ways. A world brought to glorious life by artists I didn’t even know (Carmine Infantino and Joe Giella actually, and issue #115 was the first crucial step in my learning who these gods were). Grodd swaps brains with a man named William Dawson, who joins a circus (didn’t everybody back then? ), trains chimps to steal, and then draws the attention of the Flash. Dawson/Grodd invents a device to blow the Flash up to an enormous size, the Flash figures out how to save himself, and then tosses Dawson in Jail not realizing that he has captured his arch enemy Grodd. Somehow this story managed to push every button I had and then some. Whacky over-the-top science, grotesque villains, and a hero whose super power was running fast, a power that seemed almost attainable. 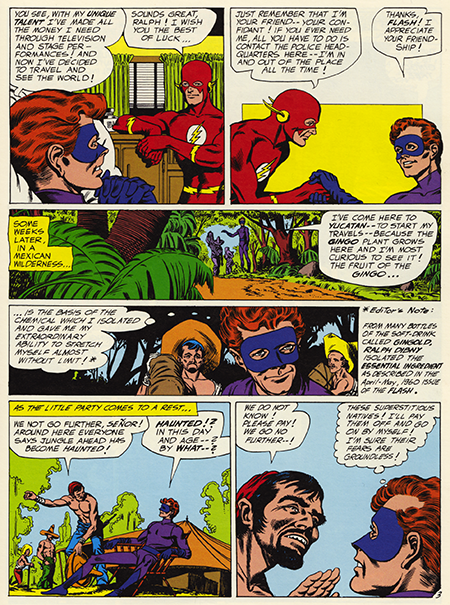 The second story featured the second appearance (even though it was my first) of the Elongatedi Man and I was immediately taken with the friendship between Barry Allen and Ralph Dibny. Usually in comic books, when the heroes weren’t fighting villains, they were fighting each other and it was a new twist to see a couple of heroes just hanging out. It spoke to the fact that the characters could be more that simple fighting machines. Again, John Broome was opening the door to writing characters with a little more depth than you were used to seeing. Again brought to gorgeous life by Infantino, this time with the inking assist from Murphy Anderson. When the Elongated Man calls on his friend the Flash for help in dispatching an alien menace, it seems perfectly natural, and, in the end, the two heroes make a pretty good team. Now we come to the part of Julie Schwartz’s books that made them really special, the lettercols. In a letter to the editor page called Flash Grams, Julie opens the door to the comics kingdom to his young readers. He addresses his young readers as adults, doesn’t insult their intelligence and treats their thoughts and opinions seriously. He was the coolest adult in the world. Julie had been a young science fiction fan himself so he brought the same sensibilities to the table, and perhaps he saw a bit of himself in his young readers. Whatever, if you chose to converse with Julie through his lettercol, you conversed as equals. That was unique and special. The best part was that you learned things reading the Flash Grams. In an answer to a question about the art from a reader, I first learned from Julie that the artist on the Flash was Carmine Infantino. I was pleased to learn that and filed that info away for future reference, but that was only the beginning. The Flash lettercol would soon become a cornucopia of comics knowledge in ways that I wouldn’t even have dared to imagine.